Par un martinet/Hé, sire!/Hé, bergier! 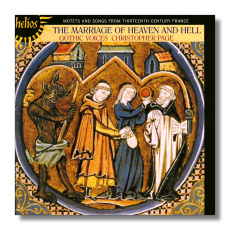 Gothic Voices with their director, Christopher Page (who's actually a lecturer in Middle English literature, not music, at Cambridge) are probably the world's foremost expert practitioners in the repertoire featured in The Marriage of Heaven and Hell – motets and songs from thirteenth-century France. First released in the early 1990s, the slightly meager (at not much more than 45 minutes) CD is still compelling, excellently-performed and essential listening for anyone as captivated as Page's forces evidently are by the two layers in these dozen and a half short (lasting from just over one to just over four and a half minutes) pieces. Two layers because in each work there are both the luscious, sensuous sounds that the five singers (Margaret Philpot, alto; Rogers Covey-Crump, Rufus Müller, Leigh Nixon tenors; Stephen Charlesworth baritone) lay onto the still air with almost magical perfection. As well as a hugely complex intellectual underpinning, the exploration of which makes familiarity with the CD all the more rewarding. At the turn of the thirteenth century in Paris a new form of song emerged: the motet. Unlike the rhythmically linear conductus, where all the voices began and ended each musical phrase in unison, the motet was based on overlapping polyphony in such a way that the 'triplum' and 'motetus' lines (etc) wove their expressions in and out of one another; only the 'tenor' held the more conventional line. Indeed the tenor may confer upon the music a sense of its being suspended in time since it is to this line that the upper registers inevitably defer and return. Motets also envisage the simultaneous unfolding of completely different texts and textual lines where the listener's delight, Page believes, comes not from our following each theme 'horizontally'; but indeed from the very juxtaposition of a medley of snatches, snippets and slices. Such a structure, though, also provides forward movement, a kind of slow, controlled springing as new ideas are introduced just as old ones are running their course. The fact that there are far fewer occasions when two or more performers will have the same vowel (because the 'synchronization' is intentionally absent) means that the motet composer can aim for a richer, denser sound. In distinction from the expectations that modern audiences may have about the refinement of the motet, in the Paris of the early thirteenth century not only would every word of a motet written in the vernacular have been familiar to the vast majority of the populace; but both the words and melody had much in common with the ring-dances and caroles heard as part of everyday life. It is generally accepted that – as the century wore on – the trouvère chanson developed, albeit with greater regularity (in stanzaic form, for example) out of the motet, although paradoxically these chansons were considered weightier and more serious than the motets, which – after having forged revolutionary new methods of expression in the metropolis – somewhat lost the initiative as the trouvères reflected the more serious business of celebrating unrequited love. Given the complexity and density of both forms, it's essential that the performers breath life into their singing. Gothic Voices do so – but in an effortless, unself-conscious way with naturalness permeating every corner of the imagined sound stage at the same time keeping our undivided attention on a single (or small group of) human voice(s). Not so casual as chatting; not so formal as lecturing. Yet the music is 'delivered'. Listen to the Par un martinet, Hé, sire!, Hé, bergier! sequence, for example. Solo singing that's down-to-earth, human, real, present. Yet as professional as to seem effortless. One's impression of the ensemble singing of Gothic Voices, on the other hand, is as when looking at a newly restored altarpiece or early Renaissance painting from which the varnish has finally been removed… bright, but with a clarity that comes from the inside. This is never better illustrated than in the Ave parens/Ad gratie/Ave Maria pieces. So this is not music that gives of its best if the sound is allowed to wash over one, if only a general impression of even the most sacred or vulgar sentiments is all that is acquired by a casual listener. Any more than one can gain very much from squinting at a crossword puzzle from a few feet away. Ideally the words are to be followed (they are printed in full, of course, in French or Latin and English in the excellent liner notes with The Marriage of Heaven and Hell). The interplay between voices learnt. And the fixed and moving parts played by each singer appreciated in relation one to another. Clear, lucid, transparent yet characterful articulation of the texts and a minimum of 'expression' in the interests of the longest and most loving of marriages between words and melody have always been amongst the strongest merits of Gothic Voices. Here too. To achieve such a balance is much harder than it sounds: although declamation can be useful, it's hardly compelling or beautiful in the context of the small, intimate acts of faith and exposure to human frailty represented by even the most plebeian motet. But after listening to just one or two of the contrasting works in this collection (the melodic line of Festa januaria, for example, will go on echoing in your head long after the CD is restored to a treasured spot on your shelves), so expert at light-handed communication are Gothic Voices that you quickly forget the hurdles they're overcoming in this regard, still hear every word but – most importantly – respond to the music as music. This CD is warmly recommended.